One of the reasons, I chose to visit Spain was the food. Who doesn’t love tapas and a glass or two of Rioja wine? We took a pintxos cooking class in San Sebastian, and in Barcelona, we visited La Boqueria Market (Mercado de la Boqueria in Spanish). The market has been open since 1840, so you know it must be special. We thought it would be nice to go to the market for a quick breakfast to try some of the famous food from Barcelona. In this guide, I will tell you what to eat at the market and give you a few tips for your visit. One of the aisles in La Boqueria Market. La Boqueria was a short walk from our hotel. It is located close to La Rambla, the famous pedestrian street in central Barcelona. The closest metro stop is Liceu on the green line (L3). We arrived shortly after it opened at 8 am and it was pretty quiet, some stalls weren’t open yet. I have heard it gets really crowded, so I would recommend that you try to go early too. If you are driving they do have parking at carrer de les Floristes de la Rambla, number 8 (right next to Plaça de la Gardunya). You can park for free for one hour if you purchase €30 worth of goods. Take your receipts to the Market Information Point to claim your free parking. Also, please make sure you are careful with your belongings as pickpockets love crowded markets. One of those anti-theft wallets that you can wear under your clothes might come in handy. I would also recommend that you get euros before going to La Boqueria as not all merchants will accept credit cards. For more tips on what else to bring, check out this Barcelona packing list. So what can you buy at the La Boqueria Market in Barcelona? Meats, cheeses, seafood, bread, olives, pastries (empanadas), fruits, vegetables, juices, candy, gelato, and popsicles, to name a few. You can buy large portions to take home or smaller ones to try while you are there. 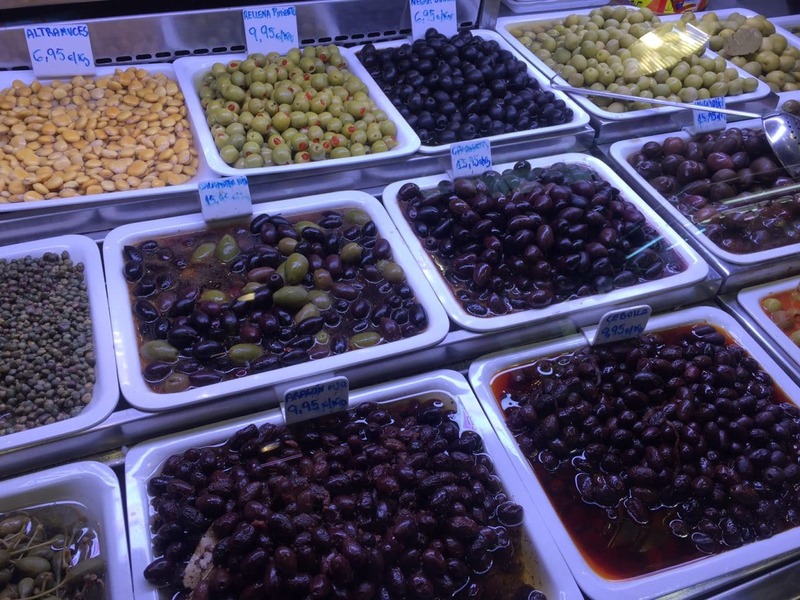 A pretty impressive selection of olives at La Boqueria Market. There was a really impressive selection of fruits, vegetables, and juices. I was impressed to see dragonfruit – a fruit with a red skin, white/red pulp, and black seeds – which I really see in the US. Since I was thirsty and it was only €1, I did try one of the juices, which was really refreshing. 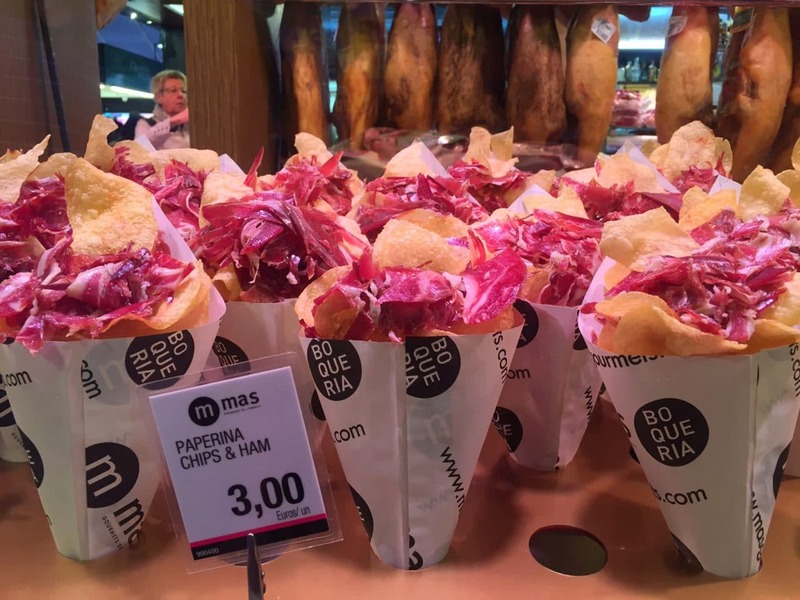 They had paper cones filled with ham and chips as well as ham and cheese. Great for sharing. We also had to sample the meats and cheeses. We tried one of the samplers that they serve in a paper cone and it was delicious. We also explored the seafood section. You could tell the seafood was really fresh because some was still alive! In addition to the raw seafood, they did have some cooked that you could try there. Some of the fresh seafood. They also had crabs that were still moving! Empanadas are one of my favorite foods so of course, I had to try them. There are all sorts of shapes and sizes and types, so it was hard to choose. My high school Spanish really came in handy here, I was able to figure out what we were ordering. The spinach one we had was a little disappointing but we did really enjoy the one filled with ham. 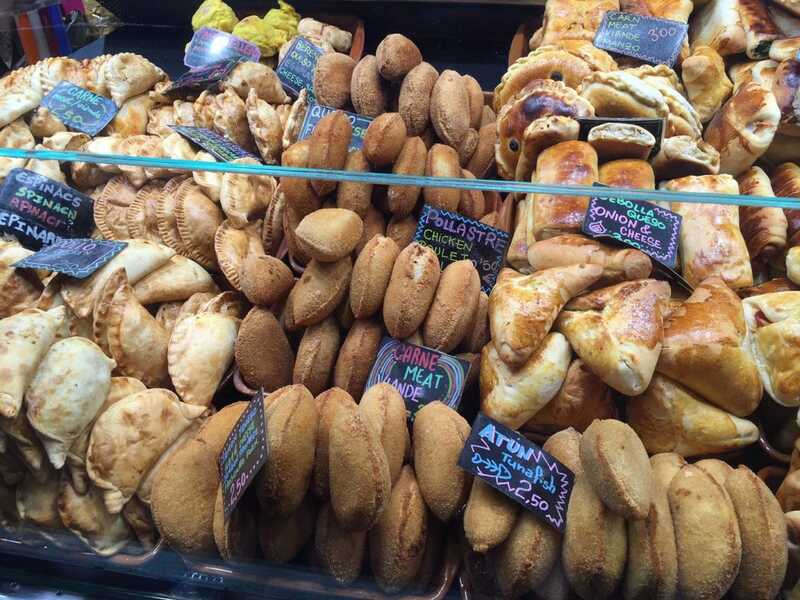 Empanadas are one of my favorite foods! The prices vary between the stalls so don’t just buy at the first place that you see. If you like, you can try bargaining too. We only bought small items and I thought they were reasonably priced so I didn’t feel the need to try or maybe it was because it was so early in the morning. 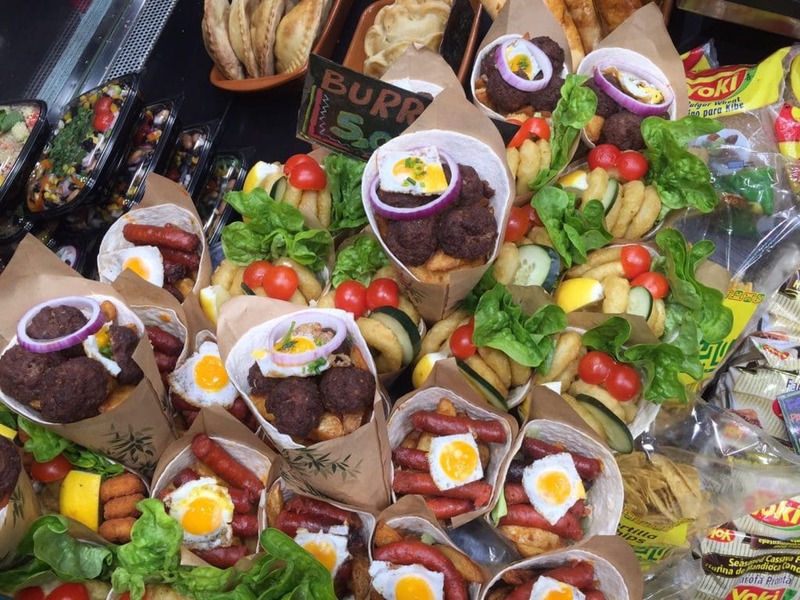 In addition to the typical stalls you would expect to see at a market, there are tapas bars as well. The La Boqueria Market tapas looked delicious. You can just grab a seat at the bar and place your order. If you like you can also have a glass of wine or cava. We made two mistakes when planning our visit to La Boqueria in Barcelona. First, we weren’t that hungry. There was so much food that we wanted to try, but there just wasn’t room in our stomachs. Secondly, we didn’t leave enough time. Of course, you can just walk through the market but I really enjoyed seeing all the stalls and what they had to offer. I would have like to relax at one of the tapas bars too. I would love to go back to explore more of the market and try more of the food. Also, I think it would be fun to take a La Boqueria market tour that includes a cooking class or even a Barcelona food tour. Have you been to La Boqueria Market? What did you buy? 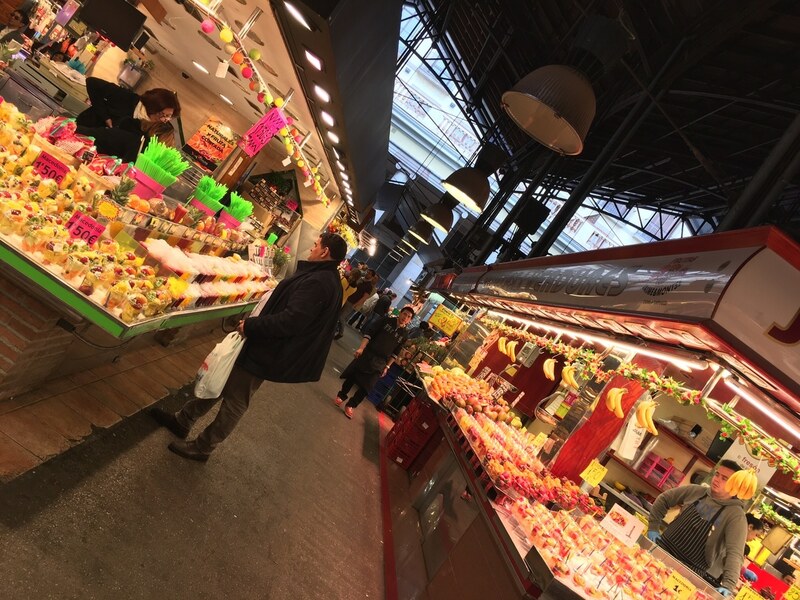 La Boqueria Market is open from Monday to Saturday from 8 am to 8:30 pm. If you have a refrigerator where you are staying like most vacation rentals, you could buy food for future meals. If you can bring Ziploc bags, this will help make sure the food stays fresh. This could be a real budget saver. Don’t buy from the first stall you see, the prices will vary so check around. As with other popular tourist spots, you need to watch out for pickpockets. You might also find these safety tips for solo female travelers helpful. We are happy to co-host the Weekly Postcard Linkup. Everyone is invited to join us and share their travel blog posts here beginning at 12 p.m. (PST) / 8 p.m. (GMT) Friday, March 10th. The instructions are below, but if you have any questions, feel free to reach out to us. Happy Travels! I was there just about two weeks ago! So colorful 🙂 I loved watching all the variety of sea food, I hardly could recognize what most of them were! The way the fruits and vegetables were presented was also really impressive. Great place! Ioanna – Yes it is such a colorful place with so many options. So glad to hear that you enjoyed it too! Wow! It all looks delicious. And so colorful! I love walking through local markets wherever we find them, even if we don’t buy anything. To me, local markets simultaneously feel exactly the same as and entirely different from every other market I’ve had the pleasure of visiting. Laura – Thanks! Glad to hear you like markets too! Its a great way to experience local culture. I loved this market! Went there with a food tour..and remember having olives, cheese and a lot more. I was thrilled to find delicious vegetarian options and compile it all later. So cool that you were staying close to it! Where exactly were you staying? Glad to hear you liked it. We stayed by Plaza Catalunya. I loved the area but didn’t love the hotel. I love visiting food markets. They usually have so many different new foods to try out. And yes, it’s always best to go hungry. I haven’t been to Barcelona yet but I want to visit this market when I do. Thanks Sara. Glad to hear you like markets too, La Boqueria was one of my favorites. Irina – Yes it is such a colorful place and the food is amazing, you would love it. Megan – Glad to hear you like markets too. In Asia, I love the night markets, they are so fun. Boqueria market is one of my favourite markets! There’s so much colours and food to try! Yes, there are so many tourists there so it can be a bit of a tourist trap. I totally agree with your tips to make sure your visit is enjoyable. Alaine – Thanks so much. Yes I think it is a must do in Barcelona. This looks absolutely delicious! I had never heard of that place ! Hmm so hungry now 😉 pinning this to an appetizing board! Thanks so much. It’s a great place with so many delicious options. Oh…. this place always makes me hungry – especially all these food stands with exotic fruits! Been to BCN so many time and always try to find a moment for La Boqueria Market! 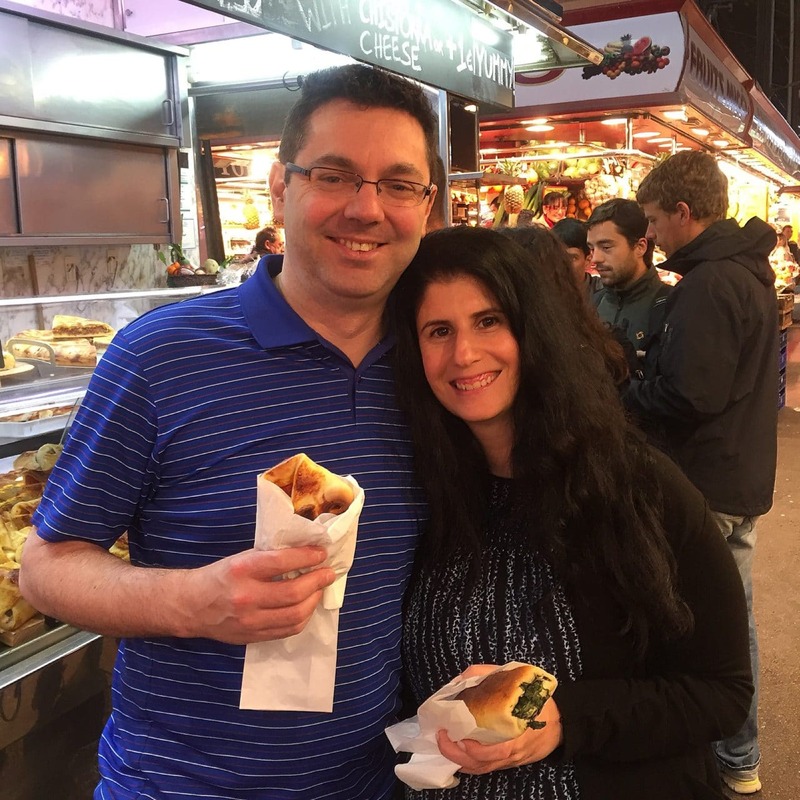 Anna – Glad to hear you enjoy La Boqueria too! Corr I could eat some of those chips and ham right about now! Absolutely adore Barcelona, there’s incredible food available no matter which way you turn! Amy – yes the food there is so good! 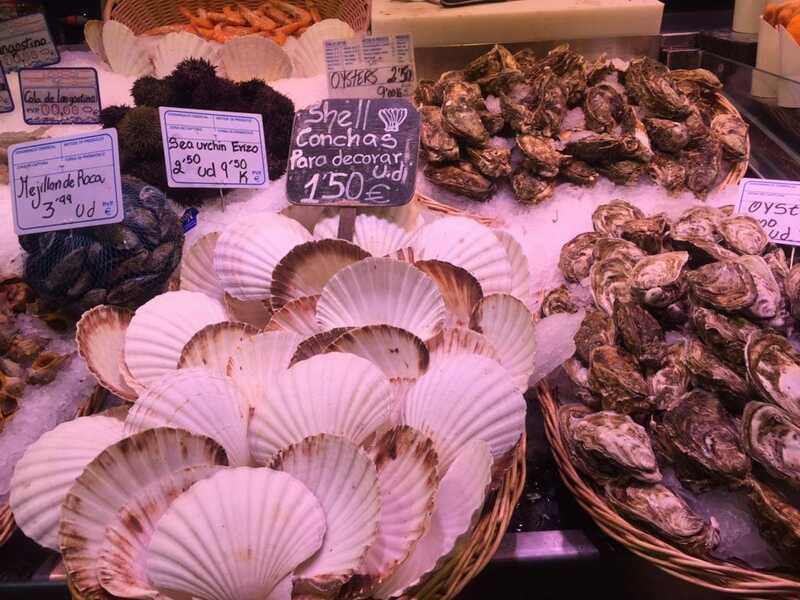 We were just at this market at the end of January – we stopped by a couple of days as we were staying nearby. It wasn’t very busy at all then and we enjoyed wandering around the market but we didn’t buy anything (a bit pricey compared other places) but there are a lot of speciality items there! Jessica – Glad to hear it wasn’t busy when you went. You do have to be careful about the prices, some of the stands were expensive but we did find lots that were reasonable. You are so right, the food in Spain is amazing! If I could I just convince my boyfriend of the same haha! I never made it to Barcelona, but lived in Alicante for a year and a half and loved to spend time at the markets. This flashback made me miss life there all over again! Nice! You were so close to Barcelona. I hope you can convince your boyfriend to go there, its such a great city. I love La Boqueria! I stayed near there when I was in Barcelona and I went every morning for fruit juice. My favorite thing to eat there was definitely the ham cone. I completely agree that it’s important to come hungry. Stella – Glad to hear you love it too. I wish I could have gone there every morning! La Boqueria looks excellent and since I may be in Barcelona quite soon, very good timing with the post! David – Excellent. I am sure you will enjoy it. I have a few other Barcelona posts that may help with your planning. Note to self: Go hungry and allow a lot of time. Thanks for the advice. I always like visiting food markets when traveling someplace foreign to me. Ham and chips sounds like a genius idea. Michele – Yep you got it. You will love that market.